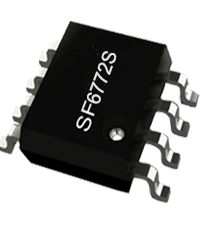 SF6772S is a high performance, highly integrated QR (Quasi Resonant Mode) and Primary Side Regulation (PSR) power switch for offline small power converter applications. SF6772S has proprietary super-QR/PSRTM control for high efficiency and low EMI, which can ensure system to meet EPS Level 6 energy standard. The IC also has built-in cable drop compensation function to achieve excellent CV performance. SF6772S uses Multi Mode Control to improve efficiency and reliability and to decrease audio noise energy @ light loadings. SF6772S integrates functions and protections of FB Short Protection, Under Voltage Lockout (UVLO), VDD Over Voltage Protection (VDD OVP), Output Over Voltage Protection (Output OVP), Soft Start, Cycle-by-cycle Current Limiting (OCP), Pin Floating Protection, VDD Clamping. SF6772S is available in SOP8 package.